A short animation telling the story of a young man that our charity worked with. 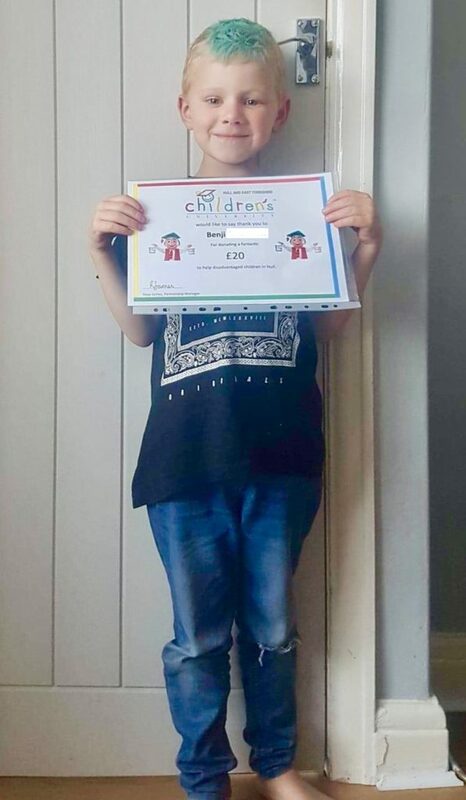 We are so very proud of Kai and all that he has achieved. 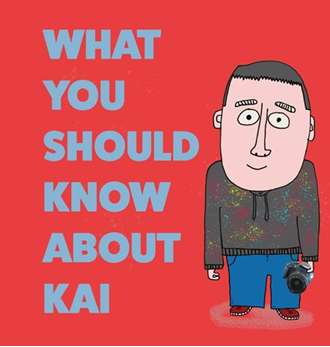 Please share and help us to tell Kai’s story. All aboard the Humber Christmas Express! The majority of the children registered on the Children In Care (CIC) Programme will not spend time with their biological families this year. For many, it is their first year living in care and they may not have any contact with their families. Although the children may be in much better living conditions and in a loving environment, the need and want for them to be with their own family still haunts many of them. Some of these children have never celebrated Christmas as others know it. No presents on Christmas day, no visits to Santa’s grotto, no build up of excitement by attending festive activities and watching Christmas light being turned on. This is where HEY Children’s University comes in to spread some magic. 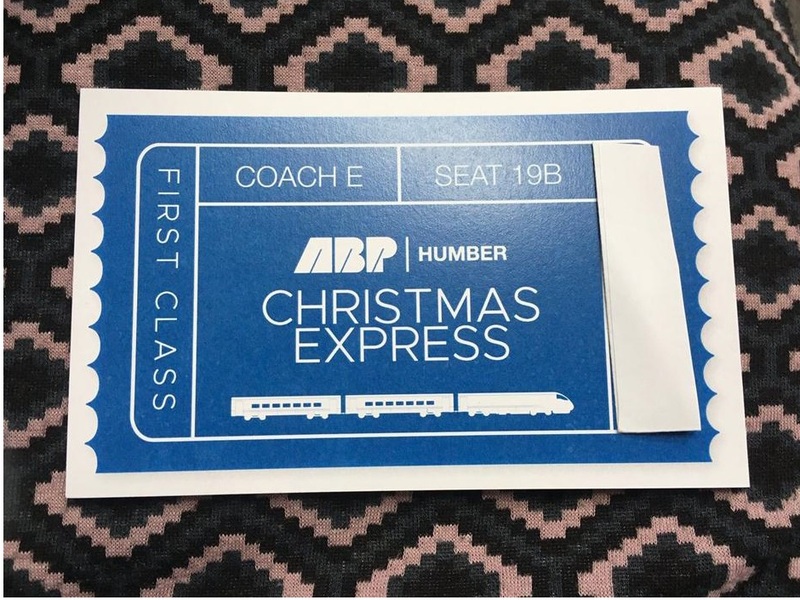 In November, one of our Platinum Partners ABP put on the “Humber Christmas Express” and gave our CIC children the opportunity to have a Christmas trip that they would never forget! The following is a blog entry from one of our mentors on the CIC programme. Christmas with the Children in Care (CIC) Programme. A mentors perspective. Destination London, Hyde Park and a visit to “Winter Wonderland”. Mentors are assembled: HCU lead, myself and a welcome surprise in my work colleague as the other mentor. The CIC kids arrive, and we are off with our select party of 10. Works on the railway means the line from Hull is out of use, so we are off on a coach to meet the train in Doncaster. Coach journey completed, the “Riviera Express” which has come up from Devon duly arrives and we look for our allocated seats in the “First Class” section. 8.50 am The Journey begins, and the kids want to tuck into their pack-ups, but today we stop them, why? Well today is special, it is the Xmas Express and we are to be regally looked after. 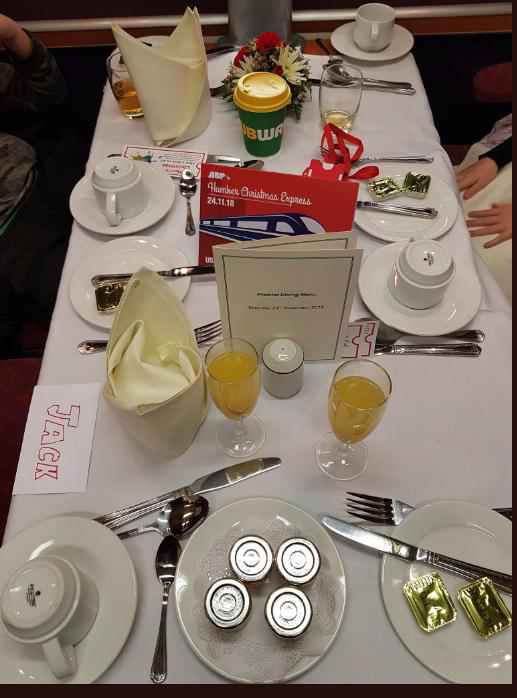 We can tell from the silver service table layout that the pack-ups are not needed, yet! We all tuck into a hearty English Breakfast served by the train volunteer staff, they are known as the “Frying Scotsmen”! Yes frying! So, breakfast concluded we look for things to do to keep the entertainment going. Card games, lots of drawings completed, some “window bingo” and just lots of ooh’s and aah’s as the various sites pass by. We now head non-stop to London Kings Cross for our day in London. When we arrive we have a transfer to the underground and onwards to Hyde Park Corner Station. We are ready to see what the Winter Wonderland has to offer! The 10 of us are let loose on the Big City event for the next 4 hours and, in hindsight, if we had 40 hours we still wouldn’t have seen everything! It was massive and the bits we did see and events we had pre-booked were all enjoyed by everyone. We started with some rides whilst we waited for our allotted times. All the kids entered the “fun house” with a little apprehension and came out laughing with beaming smiles, -that’s what makes it worthwhile and educational as some life skills are learned and then practised. 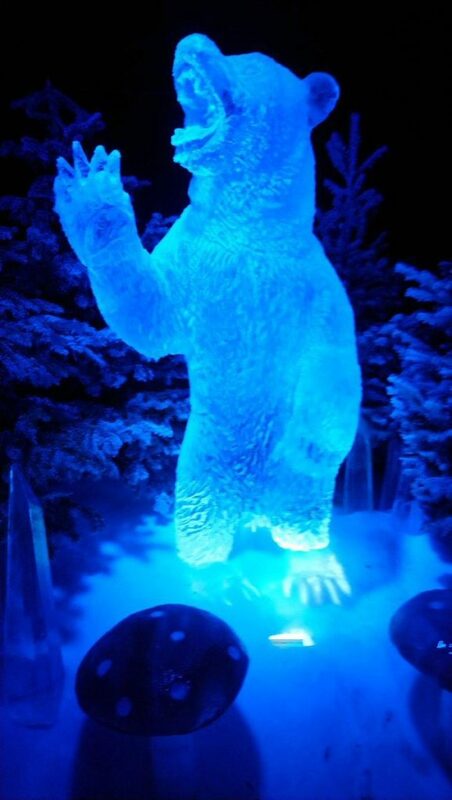 Our allotted times were upon us and we visited the Ice Kingdom to view some spectacular carved ice sculptures. Our next venture was the Snowman exhibition, explaining the making of the film The Snowman based on the book by Raymond Briggs. A final look around and another ride and then the spending of their own money on some souvenirs. We waved goodbye to “Winter Wonderland” and set off on our trip back to Hull. Good-bye to Hyde Park, hello Kings Cross, a quick stop for final souvenir shopping and we board for our return journey to Hull. Safely seated back in our First-Class seats, the table is again set for a meal on the return journey. And what a meal it was! The 4-course meal, again served by the same volunteers, gave the opportunity to have a full evening meal with typical Christmas Fayre, or for the more discerning children’s pallets, Chicken Nuggets and Chips.! The kids were excited to see the rest of the menu which included salmon in a whisky sauce, and Xmas pudding in Brandy sauce. All were keen to try the boozy offerings! Santa then paid us a visit and gave out a small gift to all. 10pm We arrive back in Hull very tired but with happy smiling faces all round, both from the great experience they had and from being back with their carers. 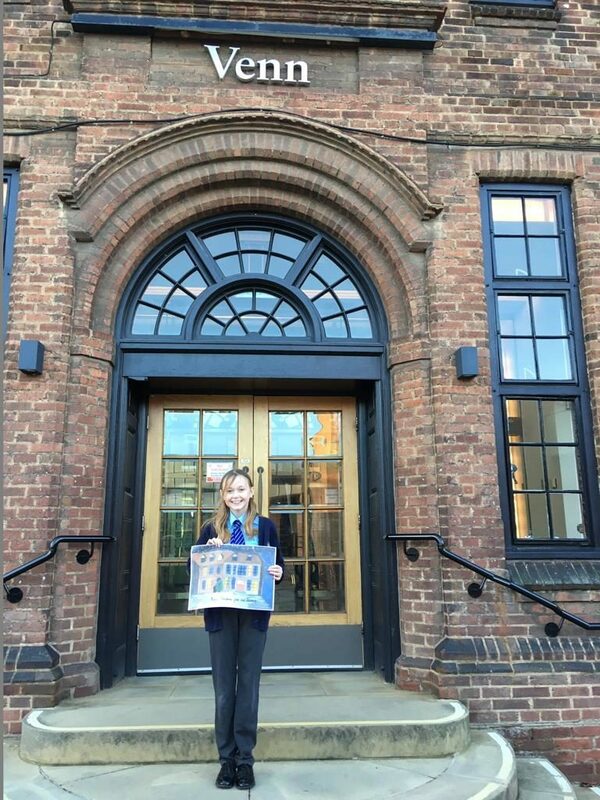 An impressive drawing of the Venn building at the University of Hull was the winning entry for a Christmas card competition organised for local schools. In partnership with Hull & East Yorkshire Children’s University, Professor Susan Lea, Vice-Chancellor of the University, invited more than 500 children from seven local primary schools to design a special Christmas card for her. “We treasure all our links with local schools and had an amazing response to the competition. The designs confirmed that we have a lot of talented children out there – and it is a pity that we can only have one winner. “The winning design showed great attention to detail and really created the atmosphere of our Venn building on a frosty Winter’s night. Alana Stuart, a year six pupil at Newland St John’s Church of England Academy, was one of 150 pupils at her school to enter the competition. 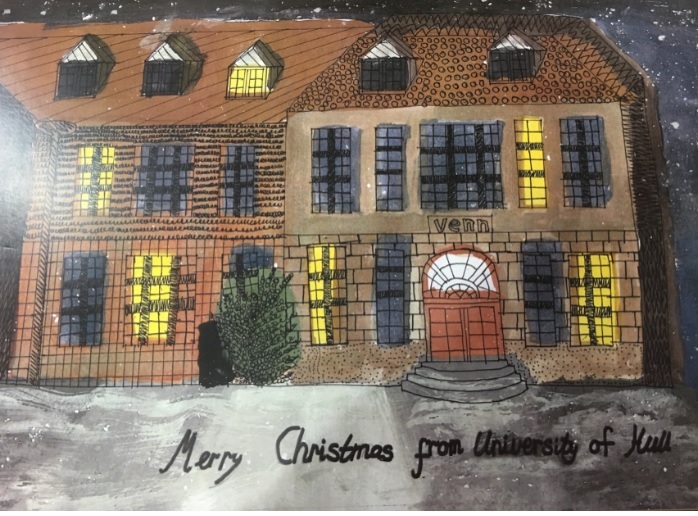 “We were thrilled when the Vice Chancellor of the University asked us to run a Christmas card competition to find a suitable design for her cards this year. 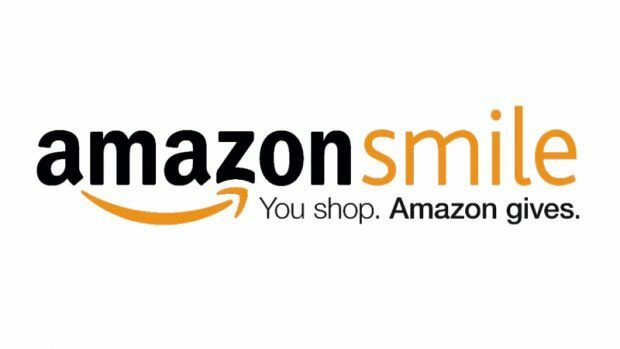 “We received over 500 designs so selecting a winner was a difficult task. The designs from Newland St. John’s school really stood out. They had taken the time to come on campus to study the buildings and do some in situ sketching. The result was amazing with the sketches being of an extremely high quality and very accurate. Alana will be presented with her prize at the University’s annual carol service on Sunday. “We value our links with both the University of Hull and the Children’s University highly, and very much enjoyed taking part in this project. 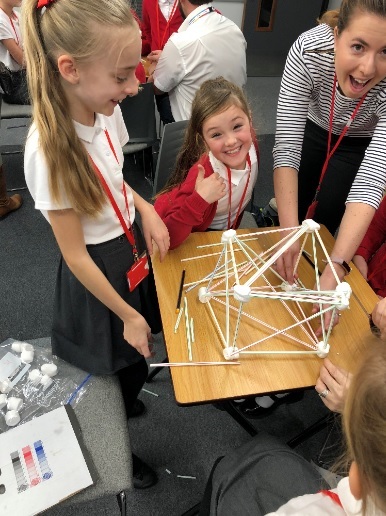 BP in Hull, in conjunction with Hull & East Yorkshire (HEY) Children’s University and the Ron Dearing University Technical College (UTC), held a STEM inspiration day for more than 60 nine to eleven-year-old girls from across the region. BP has been supporting the teaching and learning of science, technology engineering and maths (STEM) for 50 years, but this year particularly, is celebrating engineering careers and the dedicated engineers we have working within BP. By connecting these engineers with young people, we can inspire students and show them the breadth of opportunities that lie ahead for them in their future. These STEM inspiration days have been hosted across four BP UK sites this year in support of the UK Government’s Year of Engineering 2018 campaign, which is working alongside industry partners to offer young people a positive experience of engineering to help tackle the engineering skills gap in the UK. The Hull event focused on highlighting the STEM subjects to girls, to help encourage more young women into engineering. According to the Women’s Engineering Society, in the UK women account for only 9% of the professional engineering workforce – this representation is far lower than the European average. It has also been widely publicised that the UK economy is experiencing a shortfall of engineers, which poses a serious threat to industry and the economy in general. Industry plays a vital part in the UK economy and a diverse workforce contributes to maintaining the UK’s competitive edge in the global economy. Activities during the day ranged from helping the children understand how forces, in the form of thrusts and air resistance, affect the motion of a balloon rocket and how air resistance can be managed by designing a streamlined nose cone, to a structural engineering challenge using straws and marshmallows, and a team work and communication challenge using Lego. Along with their Partnership with HEY Children’s University, BP in Hull also has a Schools Link partnership with the Ron Dearing UTC, which, backed by Hull University and the region’s leading employers, provides young people with an employer-driven academic, technical and vocational education. Students can join the UTC in year 10 (age 14) and year 12 (age 16). The event was held at Ron Dearing UTC, providing the school children with the opportunity to also see where they could aspire to study. Ellie Westwood, BP Hull communications and engagement advisor, said: “At BP we believe it is important to work with young people to help them recognise the exciting STEM careers available to them. We know we need to work hard to encourage more girls to look at engineering as a future career, so our STEM inspiration day was a really wonderful way of helping these children from our local area meet our engineers and work with them to learn, experience and discover more about the world of science and engineering. “During the day, we had lots of positive comments from the children, with many of them telling us they wanted to become scientists and engineers, so we hope that events like this can really help to open their eyes to the careers that engineering can provide. Mark Ollerenshaw, vice principal at Ron Dearing UTC, added: “Ron Dearing UTC has a formidable relationship with both HEY Children’s University and BP. “We are delighted to have been part of BP’s Year of Engineering STEM day. Our relationship with BP not only provides opportunities like this event, but gives students at Ron Dearing invaluable work experience, expert careers advice and guidance and support with our curriculum, too. On Saturday 22nd September we held our “Greatest Show” Charity Ball at the Doubletree buy Hilton, Hull. A total of 260 guests took their seats under the “big top” as the Ings Primary School Choir and Wedding Belles sang their repertoire of songs to welcome them. Then it was time for our delicious circus-themed menu which included popcorn soup and funfair desserts. We were treated to a spellbinding performance from a group of local aerial performers and our compere Nathan Major even serenaded us with a Greatest Showman classic. 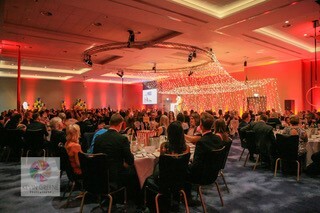 Guests took part in fundraising activities such as our “Grand Balloon Pop” and our silent auction. The event was our most successful ball EVER and raised a whopping £9,000! A special thank you to the companies and schools that bought tickets to the event: Northern Gas Networks, ABP, Rollits, Trident, Harris Lacey and Swain, St Stephen’s, Wyke Printers, Houlton, Hobson Porter, Yorkshire Staffing Services, GGP Consult, MKM, Cobus Communications, Southcoates Primary, Ings Primary and Priory Primary. Thank you to Agility Events, Ings Primary, Wedding Belles, Kevin Greene Photography, Trident, Miss Direction, Nathan Major, Dolly Daydreams Party Caravan, Influence Media for making the evening so special. ABP races for a wheely worthy cause! 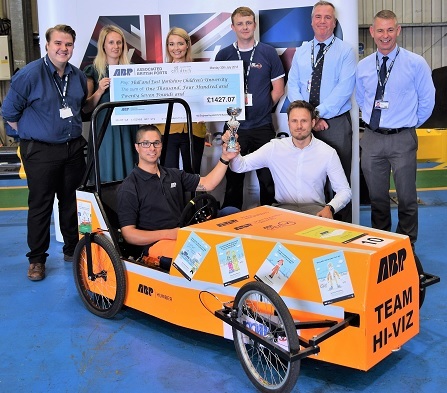 ABP Hull staff enjoyed a rip-roaring success as not only did they cross the finish line in second place at a popular kart race, The Soapbox Derby, but they also raised funds for local underprivileged children. 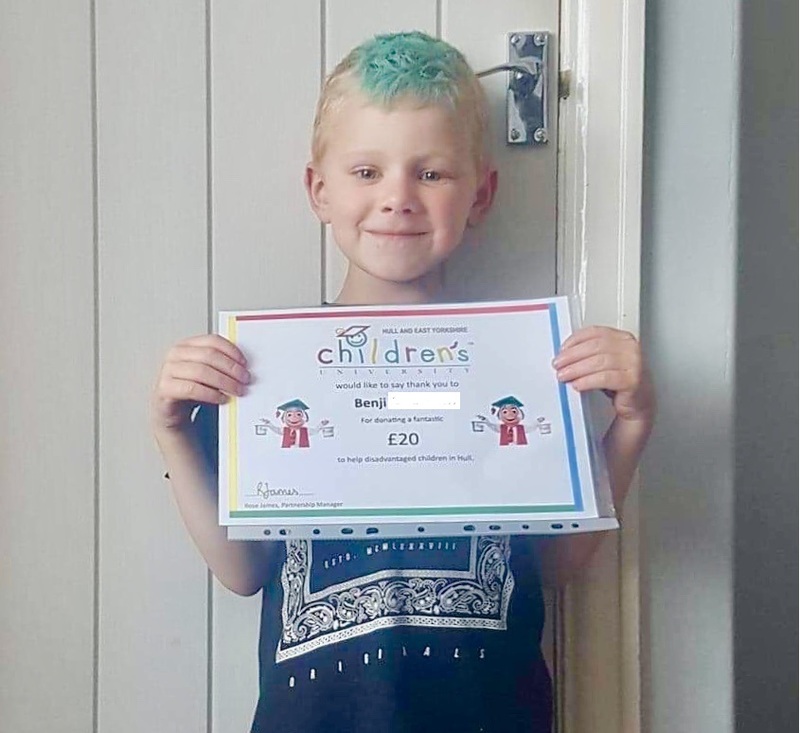 Kind-hearted staff based at the Port of Hull raised over £1,400 for Hull and East Yorkshire (HEY) Children’s University to enable local little ones to take part in an educational trip to London. The aptly named Hi-Viz crew were awarded Best Corporate team and overall second place with a time of 35 minutes and 26 seconds at the annual event near the Humber Bridge. With the help of Drury Engineering, they built the kart from scratch and already have plans in place for next year’s event! Glenn Silburn, ABP Maintenance Manager, led the build and supported the team on the day. He said: “Not only did we have fantastic fun, but more importantly we are enabling local children to have opportunities and to be inspired by trips they might not have necessarily had the chance to take part in. The leading port operator, ABP, already has ties with HEY as they offer regular trips to children around the port estate and have donated £5,000 this year to become Silver Partners with the local charity. Rosanna James, Hull and East Yorkshire Children’s University Partnership Manager, said: “We are extremely grateful to ABP for their continued support for our charity and we feel very lucky to be able to work with such a kind group of people to help inspire local children. The money raised from the Soapbox Derby will fund the delivery of a London Experience for a class of children, giving them their very first trip out of Hull! Pupils at a Beverley primary school are set to go to the polls this week as part of a pilot scheme to introduce children to the electoral process. On Friday, 6 July children from St John of Beverley RC Primary School will hold a mock election to bring to an end a project run in conjunction with East Riding of Yorkshire Council’s electoral services and the Hull and East Yorkshire Children’s University about democracy and the importance of having the right to vote. 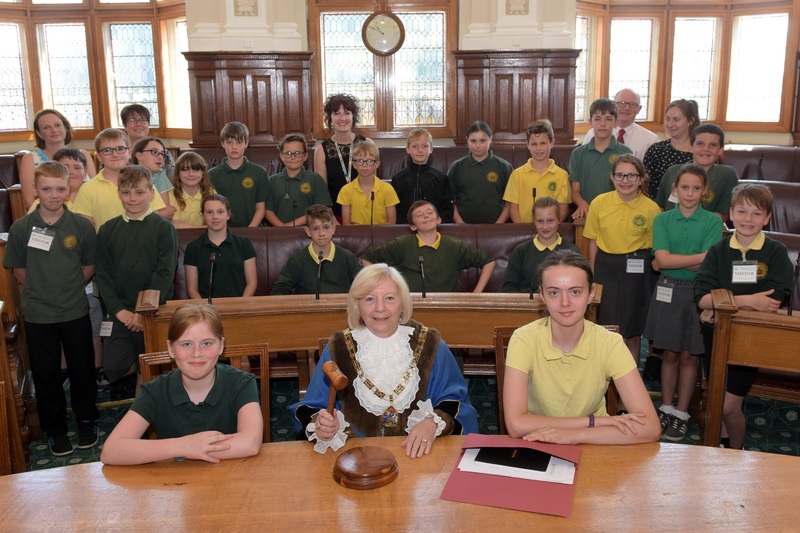 Over the last few weeks, year 6 pupils have set up their own political parties, chosen two candidates, prepared manifestos and run campaigns as well as taking part in a debate in the council chamber at County Hall in Beverley watched over by the chairman of East Riding of Yorkshire Council, Councillor Margaret Chadwick. On election day, pupils will be involved in all aspects of the election and will take on roles such as presiding officers, poll clerks and counters whilst some children will be journalists reporting the results. Once the pupils from years three to six have voted and the votes have been counted and verified the declaration will be made by Mrs Debbie Rosenberg, the High Sheriff of the East Riding of Yorkshire. Councillor Shaun Horton, portfolio holder for council corporate services at East Riding of Yorkshire Council, said: “There has been a lot of apathy from younger voters in recent elections so engaging children in the democratic process from a young age is vital as they are part of the next generation of voters. Lisa Whitton, East Riding Manager for Hull and East Yorkshire Children’s University, said: “Working in partnership with East Riding of Yorkshire Council’s electoral team to teach children about local democracy and the importance of registering to vote has been a great way of bringing the subject area to life. “It has also helped to raise the confidence of the children as they’ve debated their manifestos. Angela Nicholl, head teacher at St John of Beverley RC Primary School, said: “This has been a terrific experience for our school, not only for the children in Year 6 but for all of key stage two. “It has encouraged the children to think about what is important to them and they have taken part in debates, conducted research and worked together to produce arguments to try and win over voters. “We feel sure that the children have much more understanding of the democratic process whilst having the opportunity to practice and improve many skills.